Little is known of the Scariff area in pre-christian times. The presence of the remains of a wedge tomb at Cappabane tells us however, that this area has been inhabited for at least 4000 years. Who were these ancient people? What were they like? What name did they have for the area? Unfortunately we will never know the answers to these questions. It is only with the onset of monasteries in the early christian era that we are given some clues on life her in ancient times. The name Scariff is derived from the Gaelic “Scairbh” which means a rocky ford or crossing place. Long before the present town came into being the area was of great strategic importance to those who held the territory about and to those who sought to hold it. The presence of the great river Shannon on the one hand and the mountainous terrain on the other rendered this Scairbh a most important crossing point on a journey north or south. From the sixth century the monastery at Inis Cealtra in Scariff Bay would have played a major role in the cultural social and economic life of the area. At some point during this period an ecclesiastical site was established at Moynoe close to the shore of the lake about 1.5 miles from the present town of Scariff. It is difficult to determine the full extent or the importance of this site but it was almost certainly associated with Inis Cealtra. The men of Breifne considered it significant enough to attack and burn in 1084. This would not have been an uncommon occurrence in the centuries that followed. The name Scariff is first mentioned in 1315 in connection with a battle fought there during the civil wars of the period. The chipboard factory now occupies the site of the conflict. By the end of the fourteenth century, the Scariff area was under the control of the O’Grady clan. To maintain their dominance three castles or fortified houses were built, one at Tuamgraney which still stands, one near the bridge at the Scairbh which no longer exists and a third, smaller building, at Moynoe. A portion of this structure still survives. The earliest account of Scariff castle is from 1564. In 1580 both Scariff and Moynoe castles were owned by Edmond 0′ Grady. Following the Cromwellian invasion in the late 1640’s all changed in Ireland. The old order was gone. The influence of the clans disappeared . England’s control of Ireland was consolidated. Scariff as a town developed around the castle and its growth was helped by the presence of a smelting furnace which operated there. It is shown on a map of the Down survey in 1655. The town grew gradually in the following centuries, its fortunes generally in line with those of the country as a whole. In penal times Mass was celebrated at the Mass Rock at Cappabane. 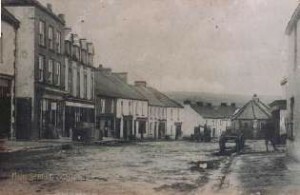 Scariff suffered greatly during the Famine in the nineteenth century. A workhouse was built in 1841 at Drewsboro to provide some relief for the poor. The last century however saw the town begin to prosper. New roads were built. It had a bank, a Police station, flour mills and a Market House reflecting its growing importance as a market town. As well as improved road connections, the Dock provided vital trade links and Scariff enjoyed its position as the business centre of north-east Clare. Like most other small towns Scariff was touched by the troubled early decades of this century. Two of its sons died on the Bridge of Killaloe in November 1920. Two of its more prominent buildings, the workhouse and the Police station were destroyed in the War of Independence. Since the foundation of the state Scariff has developed in many ways. Farming has prospered in recent decades. The advent of the Chipboard factory has been good for the area. Some old industries however, have gone into decline and closed. The town no longer has a bakery and the Dock no longer operates as in former times. It’s role now as a stopping point for pleasure crafts is perhaps indicative of the possibilities which exist for Scariff as a tourist centre. In the past Scariff has often faced change. It has adapted and prospered and it must do so again.